First of all, we would like to send out a HUGE thank you to all of you who have responded to the call to action that we sent out yesterday! The response has been nothing short of incredible. In little more than a day, we have received over 7,000 signatures on our petition and have generated over $13,000 in pledged contributions through our GoFundMe campaign to move to (and possibly even BUY) a new building. We encourage everyone to PLEASE keep sharing the petition and GoFundMe links, so that we can reach our goals, and assure that The Smell survives and has a home for generations to come! We also wanted to share with you what little new information we have been able to gather. We have spoken to the building owners, and while they have assured us that there are no immediate plans to level our building, and that we are "probably" safe for the immediate future, they so far do not seem to be ready to offer us any firm date for when our building might be demolished. We have asked them to commit to a timetable in writing, and to work with us with assistance in relocating. In the meantime, we will continue to do whatever we can to remain open in our current location for as long as possible, while forging ahead with our long term relocation plans. Late Friday afternoon, The Smell, along with most of our neighbors on the 200-block of Main Street, were surprised to learn that the owners of our building, L&R Group of Companies, had, without warning, posted demolition notices on all of our businesses. As of this posting, no other information has been made available by either the building owners or the city, and there has been no indication as to how imminent this demolition is, or how much time we have to continue to operate. Since Saturday, we have been overwhelmed by the outpouring of support, from people sharing memories, lodging protests, taking personal action and initiative, to offers assistance and advice. The response has been nothing short of inspirational. Volunteers met over the weekend and decided that it is vital to the overall cultural well-being of Los Angeles, that The Smell continue to exist and to move forward. In our view, The Smell has always been a community more than a physical space, and we will do whatever is necessary to assure that this community continues to thrive - if not in its present location, then in a new location suitable to its needs. As of today, we are launching a GoFundMe campaign to raise money to take on this fight, and if necessary, to raise the capital required to purchase a new location, so that we never have to go through a crisis like this again. 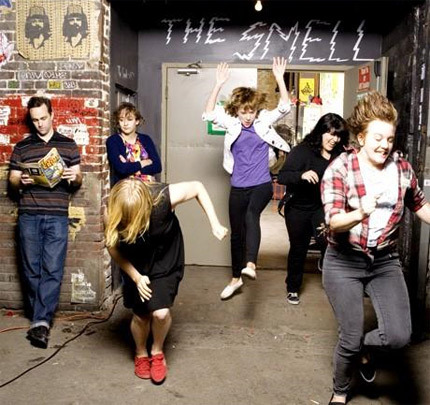 This GoFundMe campaign is the only legitimate place to donate to The Smell. We also ask that you take the time to sign a petition and share testimonials that we can present to the building owners and the city ­­ the more signatures and testimonials, the better. As stated earlier in this post, we do not currently have any details beyond the demolition notice, but we plan on trying to clear that up with the building owners and the city as soon as possible. As new information becomes available, we will share it publicly. The Smell is more alive than ever and we thank everyone in the community for being a part of it throughout our 18+ year history.